The plague monks really are terrible models aren’t they? Surely by now the Skaven – one of GW’s most iconic races – are deserving of some new miniatures, replacing some of the ghastly sculpts of yesteryear with sharp-looking modern models. Perhaps if I get my existing plague monks painted the seerlords in Nottingham will take pity on me and send some reinforcements that aren’t quite so ghastly. Alas after all my progress last month it’s been hard to maintain momentum now I’ve moved onto the ugly monks. In spite of my complaints about the models I did at least have fun with this banner. My hope was that by painting them in a suitably filthy and disease ridden style I’d be able to cover up, at least in part, the fact that the models themselves are so ugly. To some extent I think it worked but I can’t pretend they’ve been a joy to paint. Indeed I’ve been starting to fear that I would soon abandon them all together, shoving them to the back of the shelf in favour of better looking rats. However before it comes to that Azazel’s latest challenge, “Junit“, drew my attention. Now I must admit that I wasn’t planning on taking part, preferring to take it easy and pursue whatever took my fancy after the (ultimately very successful) challenge of Neglected Model May. However it strikes me that there really aren’t a lot of plague monks left to paint. It wouldn’t be unreasonable to try to get them all done in June and I can sail into July free in the knowledge that these hideous miniatures need never trouble me again. At times it seemed like a desperate flight with a deadline snapping at my heels, at others like a heroic last stand against a rising tide of unpainted models, but with the end of the month upon us I’m pleased to say that victory has been achieved! For those coming late to the party, blogger Azazel has declared May to be Neglected Model Month, challenging himself and other hobbyists who wanted to take part to finish off some of those old, unfinished models which have been left to gather dust. I took on a rather ambitious goal, by my standards, and at the time worried a little that I might have bitten off more than I could chew. In retrospect however I’m pleased not have stinted in my efforts and to have managed a sizable addition to my chaos collection. 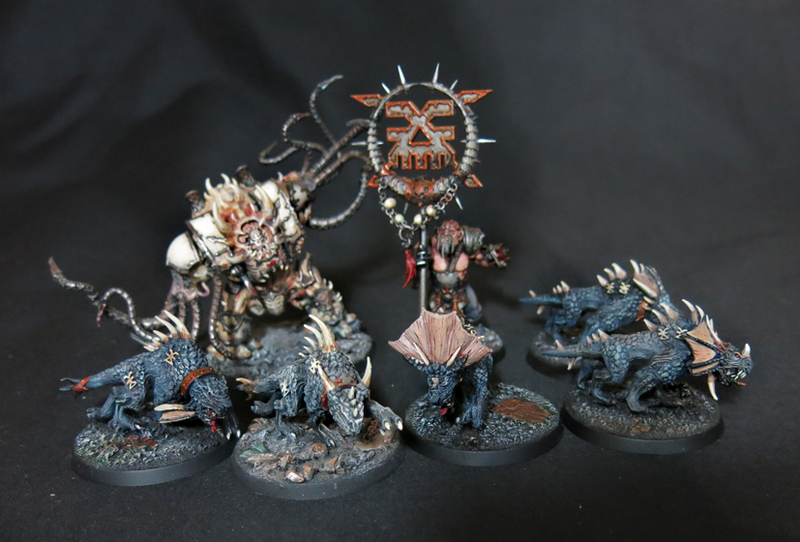 The forces of Khorne for instance grew significantly with the return of an old helbrute, a pack of ravenous flesh hounds and an ogryn berserker. Meanwhile Nurgle gained a bloat-drone and a heap of happy nurglings. Even Tzeentch got in on the act with this unplanned “stretch goal” – a converted tzaangor. The eagle-eyed amongst you will have spotted that the nurglings have had a little update since I first showed them. That’s right – I forgot the nasty green gunk on the bases. 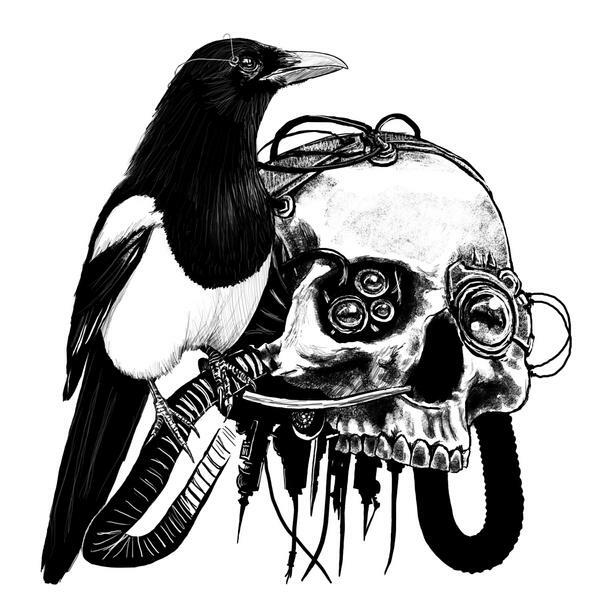 Hopefully the plague father will forgive me this transgression and won’t bestow any of his gifts upon me. In spite of the pressure I felt at times not one of these models took me more than an hour to finish – with the arguable exception of the ogryn where I found myself hating everything about the banner and repainting it from scratch when it was almost finished. Nonetheless, even in what was, for me, a very busy month at work I still managed to complete ten neglected models – plus the additions* to my Skaven that I’ll show you tomorrow. *”Additions” being an ambitious plural right now as only one is actually done at the time of writing, however there are at least a couple more I’d like to finish off to join it if times allows. Still, with none of these taking more than an hour to finish, and with a whole day of May still to go, a dedicated person could shift twenty-four models from the shelf of shame (although the last few would undoubtedly be of variable quality…). Silliness aside though it goes to show what can be achieved if one just breaks the deadlock, picks up the brush and a half-painted model and just gets on with it. All too often they just sit there, unfinished and shameful, and it doesn’t need to be this way. Huge thanks once again to Azazel for creating the challenge, without which I would never have been inspired to finish these – at least not this decade. Now back to your brushes the lot of you, you could have finished another model in the time you spent reading this! How time flies eh? 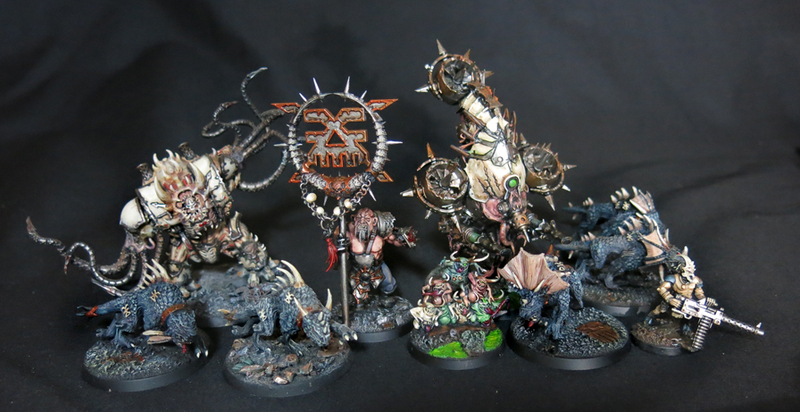 Back in January 2015 I set out to paint four bases of Nurglings, with a few more to assemble at a later date. The first three I rattled through in a mere few days. As for the fourth, well they’ve only just come bouncing off the painting desk now. As ever thanks for this minor victory over the unpainted masses rests with Azazel, the man behind the Neglected Model May challenge. Anyone who’s been keeping track of my progress will know that, with just under a week of May left to go, I’ve got only one model from my initial bold pledge still to paint, the Ogren banner bearer. 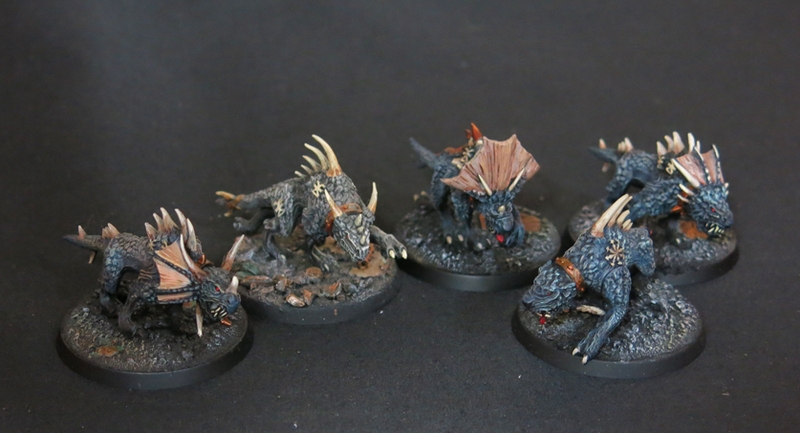 That said I also need to get some rats finished for my Skaven over the next few days as well – no rest for the wicked indeed! A quick interruption to the theme of Neglected Models today, but I had so much fun making Gor Halfhorn, and the model was so well received, that I decided to try my hand at making my own version of Grendl Grendlsen. As with Gor I’m actually quite taken with the official model but there’s no way I can afford all of the Necromunda heroes that I like the look of, and as I have the bits to make Grendl available I decided to give it a shot. Gor has a lot of characteristics that make him stand out, characteristics which can then be played upon to make a kitbash that is recognisably him. Grendl on the other hand is pretty much a generic squat – the excitement comes from the fact that he’s a squat at all, particularly in an era when the term is associated more with a race being canned than with the space dwarves themselves. Needless to say this made the task of recreating him that much harder as there were fewer obvious traits to copy. Here’s how he looked on the first attempt. Overall there’s nothing especially wrong with him but I still wasn’t terribly happy. He may have Grendl’s gear but he still just looks like a generic squat, plus the way he’s holding his weapons blocks his face from in front, making him look defensive and weak rather than bold and strong. Time to try making a few adjustments, including making a head that’s more reminiscent of the official Grendl. Of course this did involve cutting two tiny heads in half and splicing them together, undoubtedly the hobby activity most likely to wrack my nerves and bring me out in a cold sweat. Before becoming trapped on Necromunda following the assassination of his liege, the Rogue Trader Constant Gerrit, Grendl was a banner-jarl of the Vega Rams mercenary company. Having spliced on the new helmet I was intending to shave off the Imperial Guard insignia but, after consideration, decided to leave it as a nice visual reference to his heritage amongst the soldiers of the Imperium. I feel this second version is definitely an improvement, although I may still make a few more tweaks before I paint him so if you have any feedback I’m all ears. What’s this? Four neglected models in one week? 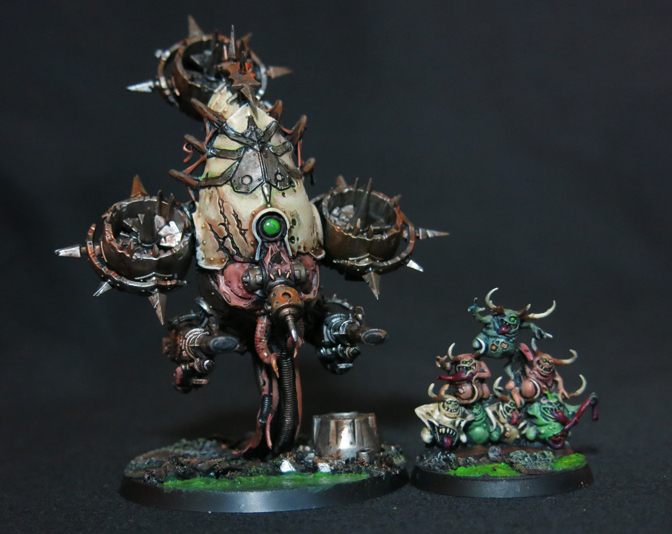 And the long overlooked bloat-drone finally finished to boot? Surely some madness is occurring? Although I ended up taking a lot longer over this model than I intended to, I’m still glad I took my time and didn’t rush it. Even with a range of vehicles now available for the Death Guard the quirky strangeness of the bloat-drone means it remains my favourite. The bloated, fleshy back was a real joy to paint. In the long term I’d like to add a couple more of these to the collection to create a suitably Nurgly triumvirate, and of course to allow me to model all three weapon options. Before I even think about buying any more of them however there are plenty more neglected models to deal with before the end of the month.